While I suppose all young learners appreciate some creative, hands-on tools to liven up their task, little boys seem most interested in movable instruments. I can’t lay claim to conjuring these ideas from scratch, but I thought I’d share some things that are working in my home school. change the beginning sound or number to be multiplied. I cut index cards to fit the opposite side of the case (where the album cover would normally be). On these I wrote the simple word endings (at, it, et, ot, in, on, op, ack, ick, etc.) and the second factor. 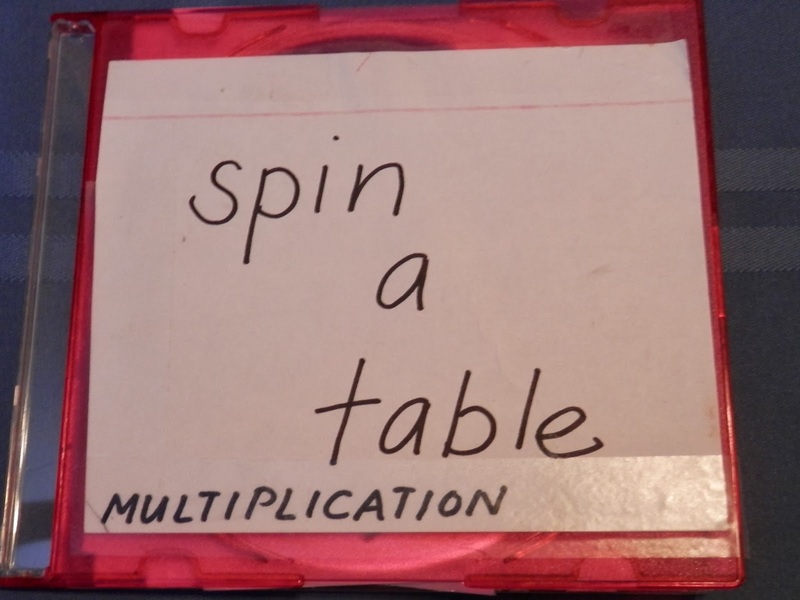 For the multiplication tables, I wrote the whole family of products and taped this to the index card so that it can be folded back (to hide the answers). For reading, I simply let my 5 year old sound out all of the words without bothering to correct real from false words. As for the occasional, SH + IT, I just ignore it since my son has no idea this is a “bad” word. The matching nail board is a work in progress. It consists of a piece of wood (an old shelf board), nails, string and card stock. The idea is to match the two sides or to work back and forth. So far I created the Ten Commandments so my 2nd grader can practice the proper order. He also has to memorize The Act of Contrition so I created a back and forth pattern to help him practice. My daughter hates Latin, but she’s about to start a class in it, so I’ll make vocabulary match-ups for her. There are lots of possibilities for this one from language practice to matching number names and their digits. With years in as a home schooler, I’ve learned not to get too crazy buying every new gadget or book on the market. Limited space and budget helps me rein in my “I’ve gotta try that” temptations. These ideas were made completely out of recycled materials I already had around the house and they were easy to construct. They’ve gotten my boys interested in some self-directed learning masquerading as tactile fun. This entry was posted in DIY educational materials, education, hands-on, Home schooling, kids, mothering, parenting, recycle on January 21, 2014 by Tara K. E. Brelinsky.